Sage Narayana described the methodology of worship of Devi Sarasvati, the powerful manifestation of Mula Prakriti, the Goddess of Knowledge, Mental Faculties, Memory, ‘Mantras’, Literature and Fine Arts. 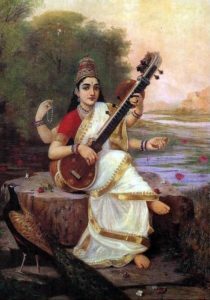 Her symbol is ‘Veena’ (Lute) and Books; Her ‘Vahana’ (Vehicle) is ‘Hamsa’ (Swan) and Her male counterpart is Para Brahma. On every Sukla Panchami of Magha month and on the day of commencing education, the worship of Sarsvati is to be performed as per Kanva Sakha Yajur Veda hymns, if possible. Being clean, wearing white clothes, white flower garlands, white sandal paste and using white conchshell, one performs Ganesh Puja first, ‘Kalasa Puja’ (Vessel with pure water and an inverted Coconut representing the Deity), then Sarasvati Vandana and ‘Shodasa Upacharas’ or sixteen types of Services like ‘Avahana’ (Welcom), ‘Asanam’(Seat), ‘Padyam’(Sprinkling Holy water), ‘Arghyam’(A kind of welcom drink), ‘Achamaniyam’(Settling down offer of water), ‘Panchamrita Snanam’(mix of milk, curd, butter, honey, and sugar), ‘Vastra dvayam’ (two sets of clothing), Sacred Thread or ‘Yagnopaveetham’, ‘Abharanam’ (ornaments), ‘Gandham’ (Sandal paste), ‘Pushpa Puja’ (worship with flowers, preferably white),‘Agarbatti dhoopam’ (incense stick burning),‘Deepa darshana’(showing of lights of cow ghee soaked vicks), ‘Neerajanam’(Showing of Camphor light), ‘Naivedyam’or offerings of eatables including fruits, ‘MantraPushpam’(Vedic Chanting) and ‘kshmapana’(seeking forgiveness of procedural defects of worship).Devi Sarasvati is pleased with the recitation of the Root Mantra, ‘Aim Kleem Sarasvathyai Namah’. Sage Narayana gave this Seed Mantra to Rishi Valmiki on the banks of Ganges and at the time of Solar Eclipse, Sage Bhrigu gave it to Sukracharya at Pushkara Tirtha; Brahma gave it to Bhrigu at Badarika Ashrama, Surya gave it to Yajnavalkya and so on. It is said that any one recites the Mantra four lakh times would attain Siddhas. Brahma gave the highly energetic Sarasvati Kavacham – kind of defence armour -to a select few and its ‘Vidhana’ or procedure is also provided by Prajapati Brahma Himself. The Kavacha was composed in Brihti Chhandah and its ‘Viniyoga’or application is for acquiring spiritual knowledge and fulfillment of desires. The Kavacha says:- Aim Srim Hrim Sarasvathyai Svaha: May my entire head be protected; Srim Vagdevathyai Svaha: my forehead; Aim Hrim Sarvasvatyai Svaha: to protect my ears always; Aim Srim Hrim Bhagavatyai Sarasvathyai Svaha: to protect my eyes; Aim Hrim Vakvadinyai Svaha to protect my nose always; Aim Hrim Vidyadhisthratri Devyai Svaha to protect my lips always; Aim Hrim Brahmayai Svaha to protect my teeth; Aim-a single word, to proctect my neck; Aim Srim Hrim to protect my throat; Srim to protect my shoulders; Aim Hrim Vidyadhistatri Devyai Svaha: my chest; Aim Hrim Vidyadhiswarupaya Svaha: my navel; Aim Hrim Klim Vanyai Svaha: my hands; Aim Sarva Varnatmikayai Swaha: my feet; Aim Vagadhisthatri Devayai Swaha: my body; Aim Sarva Kantha Vasinyai Svaha:my east; Aim Sarvajibhraga Vasinya Svaha: my South East; Aim Hrim Klim Sarasvathyai Budha jnanayi Svaha : my South; Aim Hrim Srim Svaha : my West; Aim Sarvam bikaiya Svaha:my North West; Aim Srim Klim Gadya Vasinyai Svaha : my North; Om Hrim Sarva Pujithayai Svaha:my Top; Aim Pusthaka Vasinyai Svah: my Below;Aim Grantha Bija Svarupayai Svaha:my Sides. Sarasvathi Stotram was performed in all earnestness by Sage Yajnavalka as he was cursed by his Guru Sage Vysampayana; the Guru committed a serious crime of killing a Brahmana and was atoning for the sin for long time by paying penance and Yajnavalka offered to perform the penance all by himself, and the Guru became furious and asked him to vomit all the Mantras of Yajurveda and quit his Ashram. Yajnavalka prayed to Surya Deva who no doubt gave back the same Veda Mantras but asked to pray to Devi Sarasvati to return his memory. It was in this context that the Sage meditated the Devi by various hymns that She affixed to Vedas the three significant letters ‘Anusarga’, ‘Visarga’ and ‘Chandravindu’; He recited as per this Substance: “She is the ‘Vyakhya’ (exposition) of all ‘Sastras’ and the Presiding Deity of the annotaions of these Shastras; that She is the Super Mathematician and invented the count of Numbers and Time; that She is responsible for finalising ‘Siddhanthas’ (Definite Conclusions) in guiding enlightened Rishis and Human experts); that She is the mammoth Sakti to provide Memory, Knowledge, Intelligence and Imagination and power of Speech; that She resolved arguments of Bhu Devi and Anantha Deva, the doubts of Maharshi Veda Vyasa and Sage Valmiki about certain doubts of ‘Purana Sutras’, guided Indra and Deva Guru Brihaspati on some critical explanations about ‘Sabda Sastra’; that Vishnu, Mahesa and Brahma prayed to Her and so did Devas, Manus, Maharshis, and of course innumerable humans for their own advantages.” As Yajnavalkya thus meditated and sang potent Hymns to Devi Sarasvati, She blessed him with sharp memory and Spiritual Knowledge to and he became an Illustrious and erudite Sage remembered for ages for his contribution of fifteen solid chapters of Vedas called ‘Vajasniya Samhitas’! Even if an ignoramus prays sincerely the Goddess Sarasvati for a year regularly, he or she would turn intelligent for sure; a dumb person would gain power of speech and an illiterate would secure the capacity and strong will to get educated.